The process of getting someone a gift card is kind of ridiculous. You go to a store, you take out your credit card, pay for it and then hand it to a friend. That’s the gist of it, and it’s a slow process. 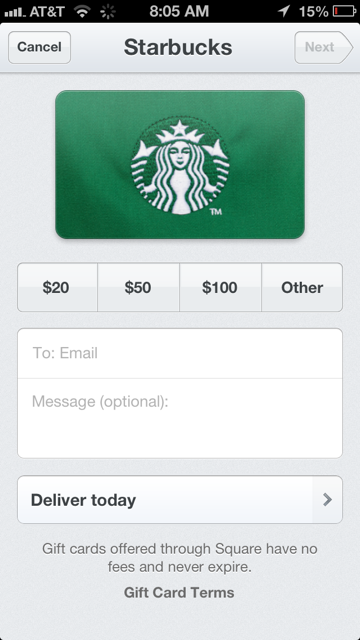 Today, payment service Square has introduced a new way to send gift cards. With the Square Wallet (or is it lowercase W now?) app you can now go through all of the businesses that use Square to process payments, pick the right one for your friend or family member, and then purchase them a gift card in the amount of your choosing. Right now, this just works for folks in the United States. Best part is you don’t have to go to that physical store and take out your credit card. Also, when someone buys you a gift card and you have Square Wallet installed, it’ll pop up in your Passbook in iOS 6. Clearly, Square works very closely with Apple, and this has to be the best implementation of Passbook that I’ve heard of to date. As you know, the company recently raised a $25 million mega-round of funding, led by their new partners at Starbucks. 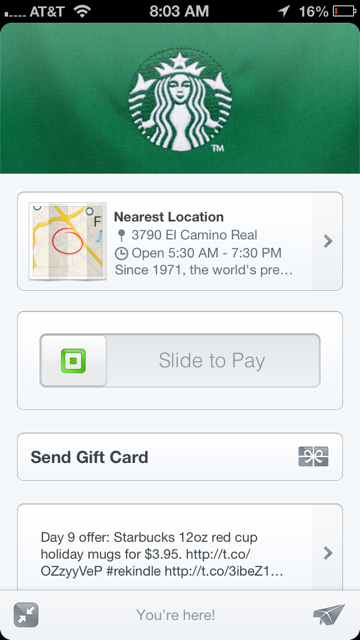 Square is now being integrated into all of the Starbucks stores in the United States. Gift cards from Starbucks are a hot gift, so think about how much money could potentially flow through Square’s payment infrastructure this holiday season. If Square gets what it wants in the world, we’ll never have to carry cash or a physical credit card again. I feel like this is a company that will go public soon or will be acquired by Apple. It’s disrupting too big of a vertical not to go onto huge things. At last check, the company is processing $10 billion in payments annually, not including the Starbucks partnership. Wow. Let’s not forget, Facebook is also diving into Gifts, so this should be interesting to watch. Is Twitter next? I hear they’re friends with that Dorsey guy who started Square.